At the South Carolina Freedom Summit, Donald Trump said that he would impose a hefty 35 percent tariff on American multinational corporations like Ford Motor Company, in order to stop outsourcing to China and elsewhere. According to the Economic Policy Institute, between 2001 and 2013 the U.S. trade deficit with China cost 3.2 million jobs, with the majority of the losses coming from the manufacturing sector. Flirting with a 2016 presidential bid, Trump is striking a populist chord with his stance on trade, and it's a departure from that of the Republican establishment and the U.S. Chamber of Commerce. Both have been working with the Obama administration to push through a massive trade deal with Asia, the Trans-Pacific Partnership. Trump's stance is surprising, not only because of his background in business, but because it would reverse 30+ years of U.S. trade policy. Instituting such a policy reversal would be a Herculean if not impossible task, requiring the eradication of the neoliberal economic orthodoxy ingrained in the DNA of Washington. China is ripping us off and abusing us because we have leaders that don't know what they're doing, and the new trade pact is a disaster because they don't talk about currency manipulation. 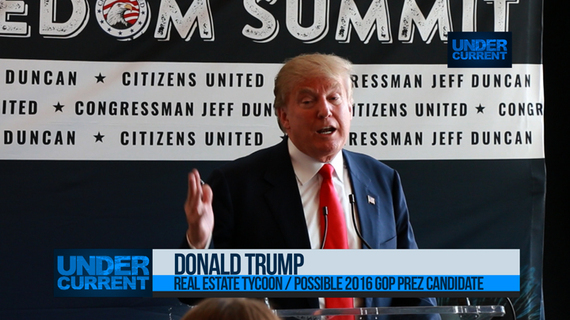 In a further break from the GOP, Trump decried the outsize influence of money in politics. With a personal fortune estimated at $4.1 billion, he said that he would "do the right thing" because he doesn't need money from lobbyists or donors.